It's your day and we can help you turn it into the most memorable day ever. As well as preparing the meal, we carefully organise the entire reception together with the bride and groom, wedding planner or whoever is organising your day, allowing you to personalise it as much as you wish. We offer our professional views and considerations all based on many years of experience to guarantee complete success and top quality which of course is fundamental: the satisfied and impressed guests you will find at the end of the day will be the most obvious and long standing testimony of this. There is only one day, we believe in this, and therefore invest all our efforts to ensure we reflect exactly what you had imagined and make sure this can be done in the most plausible, stylish and pleasurable way possible. 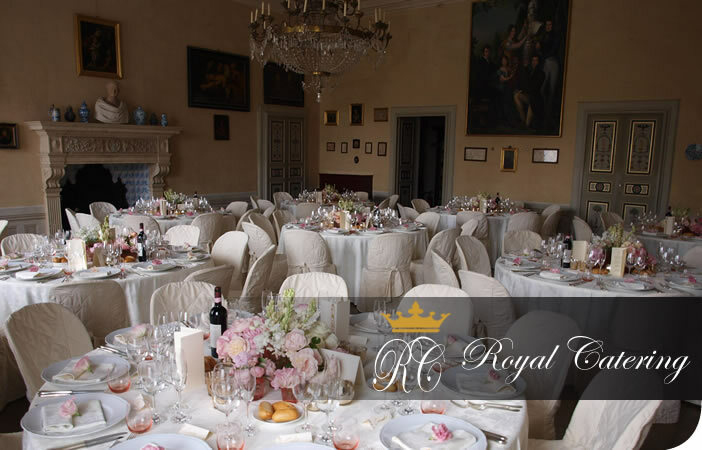 We suggest especially if you are planning from abroad (no obligation at all) you come for a day to taste the menus and see the location and to go through all the different phases of your reception party. This can include the layout of the tables, the table laying itself in its different styles and elegance, the table centre-pieces or table-flowers, candles etc. but we also have the opportunity to discuss the lighting, the music, and any other aspect which may need to be discussed in advance along side the actual timing and preparations of the meal of course. This so called “planning day” is not obligatory and totally up to you as we can do a lot via email and photos, but sometimes our clients have preferred to come and see the venue and meet the catering beforehand in order to relax and often many new interesting ideas emerge. For any information about this, please send us an email or telephone us.